How to Make Homemade Irish CreamMakes a great Christmas Gift! 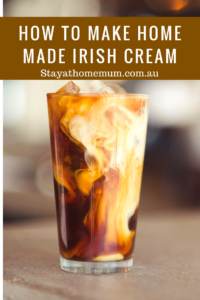 This is a beautiful recipe for Homemade Irish Cream (same thing as Baileys!) – nice with milk and ice, on it’s own, or splashed into a cup of coffee! Perfect for a dram today. This is a fantastic homemade Christmas gift for Dad or Grandpa, grab some small bottles from places like the Reject Shop (preferable ones with a hinged lid) – and make sure you run them through the dishwasher first to make them sterile. Attach a tag with some twine and you have a gorgeous gift. Homemade Irish Cream is not suitable to freeze.